The coral reefs along the Marsa Alam coast are a real treasure trove for the diver. Here you can get close to spinner dolphins, bottle nose dolphins, green turtles, hawksbill turtles, several species of shark and the enchanting but endangered Dugong (sea cow), not to mention the myriad varieties of colourful corals and fish. These reefs are mostly free from the environmental damage suffered by some further north. And whereas the dive sites near Sharm and Hurghada suffer from overcrowding, the Marsa Alam sites, being further from the larger resorts, can often be enjoyed without having to constantly bump into other divers. The best conditions for diving are during the summer months when the water temperature averages nearly 30 degrees centigrade although even in January it's a not unpleasant 24 degrees. Accordingly a 3mm wetsuit is suitable for the period from May to September while a 5mm wetsuit would be more appropriate during the relatively colder months. When planning your trip, be aware that the winter months, January to March, also tend to have longer periods with higher wind speeds and rougher seas. Also be aware that Marsa Alam can be a windy location anytime (usually more so than Hurghada), although diving is very rarely cancelled but can be limited to close, sheltered spots. We at marsaalam.com recommend either our own Sataya Reef excursion (see below) or for other excursions wwe recommend Emperor Divers. Emperor have nearly 25 years of experience in the Red Sea and were the first diving centre inside Port Ghalib back in the early 2000’s, so nobody knows the sites like them. As well as this they have an outstanding safety record, are fully licensed & insured and have won many awards for service including tripadvisor Certificate of Excellence awards for the last 3 years! They have dive centres in 5 hotels in the region, and offer courtesy transfers for anyone staying within 40km of the airport. Whether you choose to dive with Emperor Divers or not, their website is a great source of information for anyone wishing to dive the sites around Marsa Alam. safari boats departing from all the major red sea ports. You can email Steven on steven@marsaalam.com to get put in touch, or email Emperor direct on reservations@emperordivers.com. Price lists can be found on the pages beneath the diving tab above. Diving depth - up to 25 metres. Location - close to shore - wade in from beach. 30km north of Marsa Alam. Visibility - 5-20 metres. Best in deeper area. Suitable - for all diving levels. Despite the absence of a coral reef and not infrequent poor visibility, Marsa Abu Dabab is perhaps the most popular of all Marsa Alam's dive sites and for good reason as it is probably the best place to get close to sea turtles and the dugong. Fortunately the bay has recently been closed to boats making both snorkelling and scuba diving easier and more relaxing. It is also a dive site suitable to all skill levels. You have a very good chance of seeing Abu Dabbab's semi-permanent dugong sea cow residents Dennisand Dougal. A Dugong is a large herbivorous marine mammal, brownish or dark grey in colour, with no dorsal fin or hind limbs but with paddle like forelimbs and a dolphin like tail. Dugongs love the shallow sheltered waters of Abu Dabab because of the abudance of their favourite food - sea grass. Consequently they are sometimes refered to as "sea cows." Sadly, despite having a lifespan of over fifty years, the Dugong's days may be numbered. The International Union for Conservation of Nature lists the Dugong as a species threatened with extinction. The shallow surf free waters in the bay are also an excellent location to see large turtles. These suprisingly large animals are usually happy to allow divers to approach close to them, which makes for a great photo opportunity. They are often accompanied by remora fish which cling to their shells and help to remove parasites as they feed. Guitar sharks also frequent the shallows. These are an endangered species and one of the world's rarest sharks. It has bizarre but beautiful looks, as if a sting ray had been crossed with a real shark, but don't worry, it's not aggressive. However never touch them as a flip of its' tail could dislodge your mask. For more information and latest offers on diving and snorkeling packages email steven@marsaalam.com or visit the Emperor Divers website. What makes this reef so special is that so few of the tour operators currently visit it as it is still not yet as well known as Dolphin House (also see below). This means you probably stand a better chance of swimming close to dolphins as, contrary to what you might believe, these friendly but easily stressed animals often avoid areas where there are too many people and boats. Excursions here are offered daily (except Saturdays and Sundays) and an excellent value fee of 45 euros covers your transport to Hamata and back, your boat and all necessary permits, your snorkeling equipment, a professional guide, a freshly cooked lunch on board and a choice of tea, coffee, bottled water and soft drinks at any time of the day. The price covers a full day's excursion leaving your hotel at between 4.30 and 5.30am (depending on location) and returning at about 5pm. Contact Steven on +201284332337 or email steven@marsaalam.com for more information. and 10km from the shore. Suitable for experienced divers only. The top of the reef plateau here, some 300 metres long and 30 metres wide, is between one and 40 metres deep, but at its' edges there are near vertical cliff walls. The west drop off is a little less vertical than the east and sandier with some overhangs and small caves. "have a tendency to be very curious of divers and from time to time "bump" or "nose" divers, especially near the surface." The reef attracts an enormous variety of sea life including jacks, tuna, blue lunar fusiliers, black snapper and lone giant barracuda watching the reef from a distance. Legend tells that a large arch at the southern end of the reef, some sixty metres below the surface, contains the sarcophagus of an unknown pharoah and divers have reported a coral encrusted rectangular shape near by. Beware that the current, although it normally flows north to south, can be unpredictable in direction and strength. Location - approx 20km SE of Marsa Alam. Suitable for all diving levels. This reef is one of the most popular as one of the world's most important dolphin habbitats. A large family of around sixty spinner dolphins have made it their permanent home. However, back in the summer of 2003, a sudden increase in the number of site visitors - between 500 and 800 daily - led to a sudden decline in the dolphin population. So subsequently access to the reef has been limited to protect the dolphins with buoys in the water to mark separate zones, with an area for dolphins only, another for divers only, another for snorkellers only and another for mooring boats. Visiting times are also restricted to between 10am and 2pm and the number of ticket permits sold restricted to 100 snorkellers and 100 divers daily. The spinner dolphins are a nocturnal animal and return every morning to the shallow waters of the reef to rest. Visitors are discouraged from feeding or playing with the dolphins as it is not natural for them and may cause distress. The reef itself is crescent shaped with a small lagoon of sand and sea-grass within, which is rich in marine life including the usually elusive sea horses. Divers can also explore some underwater caves and at least twelve coral towers. You should only explore the caves with an experienced guide. Visibility - 20 to 30 metres. These lie a few miles out to sea from Marsa Abu Dabab (see above). Averaging 15 to 25 metres in depth these are fairly shallow. You can dive down to the wreckage of a small ship which sunk after a fire in 2004. Dolphins frequent the area and although you won't always see them, they have been known to spend up to 10 minutes at a time with divers. You can also explore the beautiful coral garden and an underwater cave system. There are six reefs in total, and the name "Abu Dabab" can be translated as Father's stepping stones. According to local mythology, when an earthquake struck it was because the Gods were using the stones to cross the sea. Diving depth - 0m to 18m. Visibility - 15 to 30m. Location - 68km SSE of Marsa Alam. Easy wade in entry over sandy bottom. 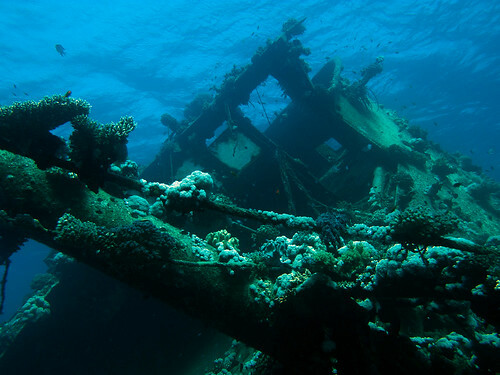 The cargo ship, the Hamada, sank in 1993 and lies on its' starboard side in two sections. It has attracted many types of coral and marine life including Napoleons, Lion fish, Surgeon fish, Butterfly fish and Moray eel. The port side of the ship protrudes just about the water line at low tide. Suitably qualified divers may be able to swim into parts of the wreck including the pilothouse, engine room and cargo hold. Almost everything on the ship had to be abandoned and now items ranging in size from telephones to a fork lift truck have become surprising homes for many types of marine life. It's a bewitching dive site and a beautiful reminder of the delicate harmony and balance between man and nature. The trip is available every day and it leaves Port Ghalib Marina around 8.00 am and returns about 3.00 pm. The cost is just 35 euros per personwhich includes your return transfer if you are staying in a hotel within 30 km of Port Ghalib, ( a small surcharge applies to tourists staying at more distant hotels - please ask) as well all your snorkeling equipment, soft drinks, plenty of bottled water and a freshly prepared lunch. Sharks can be seen at Elphinstone. In particular during certain months. Marsa Alam is well known for pristine coral reefs. Close encounters with a dugong are unique to this fascinating area. Sea turtles a common sight near Marsa Alam. Meet a Dugong at Marsa Abu Dabab. The guitar shark is harmless but don't prod it. Spinner dolphins have a more pointed nose. Take a diving course. You'll never look back. Divers explore the Abu Ghoson shipwreck - Youtube - April 2009 - 15.22 minutes. If you need a cheap limousine, taxi service or car rental at any time email steven@marsaalam.com.